What’s eating little Red Riding Hood? Following on from my last blog, I’ve been thinking about my childhood reading experience, when coming across Little Red Riding Hood for the first time. Frankly, ever since I read the Brothers’ Grimm fairy tale about some thick-headed girl who cannot tell her grandmother from a fully grown, hungry wolf I have been pleading for the wolf and all its canine kind. I recall that my initial reactions were outrage and disgust: why should the poor beastie suffer such a fate? Anyone as stupid as little Red Riding Hood and her grandmother deserves to be eaten, surely? Over the centuries wolves have gotten an exceedingly bad press for no good reason. Shy and secretive, wolves are the original canines who came to live with man – to keep our ancestors company, help them hunt, assist with shepherding live stock and be generally man’s most loyal friend. How did we repay this splendid species? We hunted them to extinction in most parts of Europe and are still cheerfully killing them in the USA and elsewhere in the world…for their skins, for their eerie howls, for their fairy tale bad press. The Ethiopian wolf has only some 500 remaining specimen living in the wild – they are among the most critically endangered animals on the planet, as are Red Wolves, where only some 200 individuals are still surviving in the wild today. Wolves and other canines have been around for hundreds of thousands of years – but since we began to take them into our homes some 14,000 years ago, we’ve done pretty much all we can to destroy them in every way we can – from hunting them for their fur to domesticating them and turning them into overbred, often crippled and in permanent pain lapdogs with hideous shapes that no longer allow them to breed unaided, breath or walk without difficulties (go to Crufts and meet any terrier, German Shepherd or British bulldog for example). Wolves are intelligent and beautiful animals. My fascination with them prompted me to make them a part of Willow the Vampire & the Sacred Grove. My ancient vampires can turn into all sorts of creatures of the night, including wolves. 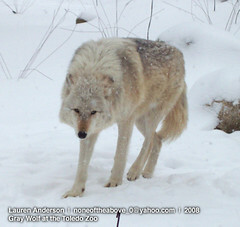 I’m intrigued by the way wolves communicate with each other through body language and long distance “phone calls”, i.e. howling. I’m moved by the fact that wolves and their kin form a lifelong monogamous relationship with their partners and that both parents are actively involved in bringing up their cubs. May their howls echo through the forests long after the despicable species “mankind” has been wiped from the face of the Earth!